Carson Wentz and Eli Manning during the 2016 season. While the Eagles' 2-3 start has caused angst in Philadelphia, there's not much celebration going on among the fan bases of their three division rivals either. That's because the NFC East has been the worst division in the NFL this season. Entering Week 6, no team has a winning record. They all lost in Week 5, and the seven total victories are the fewest of any division. So, when the Eagles begin their NFC East schedule on Thursday night against the New York Giants, they know that their clearest path to the playoffs is to win a division that lacks a team that has distinguished itself. "You definitely look at that, but at the same time, too, I think we have to evaluate ourselves and where we are, and we've got to get better as a football team overall," coach Doug Pederson said Wednesday. "I think it's still right there to be had. It's a great opportunity tomorrow night to start with the division opponent and try to capture that, because you know if you win your division, good things happen later in the season." Washington leads the division with a 2-2 record. The Eagles and the Dallas Cowboys are both 2-3, while the Giants are 1-4. Even while the emotions of Sunday's loss to Minnesota were still raw, the Eagles found a silver lining in the NFC East standings. Tight end Zach Ertz acknowledged that 2-3 was "not where we thought [the team's record] would be," adding that the "whole division is in front of us." That became more evident on Monday night, when Washington was dominated by New Orleans. Although the Eagles are defending NFC East champions (NFC and NFL champions, too), that hasn't meant much in recent seasons. There has been a different division champion each of the past nine seasons, without anything close to the dynastic rule the Eagles had in the early 2000s. They won four consecutive division titles from 2001 through 2004, and they're hoping to get back to that point. The Eagles will play six division games, including four in a five-week span from Nov. 11 to Dec. 9, so Thursday is far from a make-or-break game. But there's no question that a 3-3 overall record with a 1-0 mark in the NFC East looks considerably different than 2-4 with an 0-1 mark in the division – especially considering the next two opponents are 2017 playoff teams. "We're excited mainly because it's a divisional opponent," quarterback Carson Wentz said. "We know where the division is sitting right now. It's wide open, and we want to get off to the right start in the division." Carson Wentz and Eli Manning during Wentz’s rookie season. Thursday night games pose a difficult turnaround. Every team plays a Thursday game, and the Eagles and the Giants are on the same amount of rest, but it's far from ideal. The Eagles had one actual practice this week. They have five players on the 53-man roster out because of injuries; the Giants have two players out and one player who is questionable. The Eagles are 3-0 in Thursday games under Pederson, including two wins on short rest. (The other win was the season opener against Atlanta.) 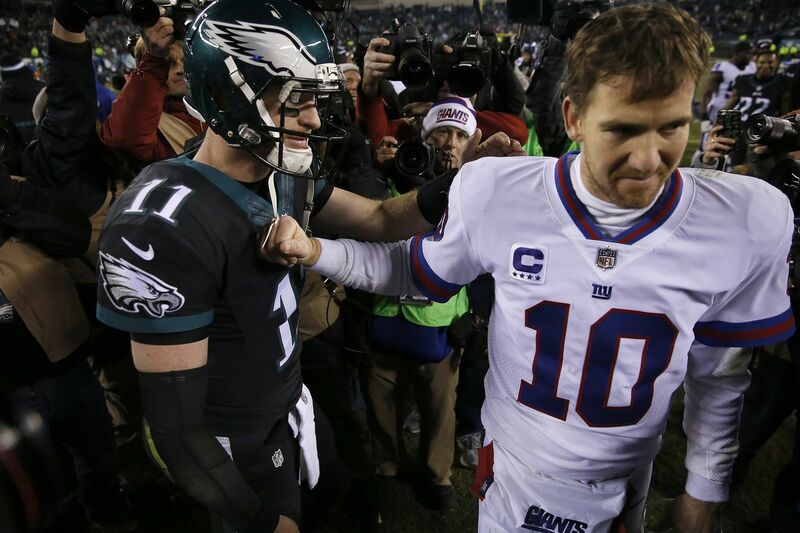 Both were impressive victories: a December 2016 upset of the Giants that prevented New York from clinching the playoffs that night and gave the Cowboys the division crown, and last season, when the Eagles beat Carolina on the road despite missing key players due to injury. It was a performance that established the Eagles as legitimate contenders. "Whether you're coming off a win or a loss, it's a short turnaround. [It's about getting] the guys back out on the practice field, mentally engaged in meetings, and then just communicating with them," Pederson said. "Really it's more about them preparing themselves physically from the standpoint of rehydration and nutrition and rest. [Those are] things we talk about a lot, especially on short weeks. …You kind of get back to the basics offensively and defensively: the kind of things you do coming out of camp, because you're in a short week, and you can't really fully study the opponent as much." In this game, both teams are familiar with each other. The Giants have a new coaching staff and a different defensive scheme. Perhaps the biggest change against the Giants is rookie running back Saquon Barkley, the former Penn State star who combines with Odell Beckham Jr. to give the Giants big-play threats. When the Giants drafted Barkley and kept Eli Manning at quarterback, they had visions of competing for the division title. They enter this game in last place, but they're only one game behind the Eagles and Cowboys. The Eagles will try to create some distance on Thursday night. "The best way to the playoffs," Ertz said, "is to win your division." The Eagles will play without safety Corey Graham (hamstring), linebackers D.J. Alexander (quadriceps) and Nathan Gerry (ankle, knee), defensive tackle Haloti Ngata (calf), and running back Darren Sproles (hamstring). All five players were declared out Wednesday. Graham, who injured his hamstring on Sunday, will miss his first game of the season. Deiondre' Hall and Tre Sullivan, who was promoted to the 53-man roster after defensive tackle T.Y. McGill failed his physical, are the reserve safeties. Alexander and Gerry also will be out for the first time this season. LaRoy Reynolds is the Eagles' only reserve linebacker. This is second consecutive week that Ngata will be out. Destiny Vaeao will be the No. 2 defensive tackle, with Treyvon Hester providing depth.